Karyn & I don’t know what to say or express how we feel. You’ve made our dream come true but I cannot overstate that you have done it in such a wonderful way! You’ve not only met our expectations, you’ve exceeded them, but more importantly you’ve done it with such a special and wonderful manner so as to make us feel in such great hands. House aside, my only regret is that we may lose contact! I enjoy your company, your conversation and most of all, your outlook on life. You’re both very special people and I hope we see each other from time to time, our door is always open. Our heartfelt warm wishes and thanks. During the design consultation phase with Sam and Simone, we were, I suspect, their largest client file before construction. Admittedly some of the complexity was due to the bushfire rating (flame zone), but the attention to detail required, our specific needs and our personal way of taking in information, dealing with it and then arriving at a decision – made our build the least stressed, most informed build we’ve done. If you are seeking a client-focused builder, Viva Living Homes should be top of your list. Thank you for the most amazing four days, for showing what house building can be, for facilitating the best get together and for being such amazing human beings. I have just finished having a quiet wander through “my” house having a smile at beautifully finished corners. We had one stinking hot day of 38 degrees. I closed up the house early and it stayed at a beautiful 26 degrees. This house is gorgeous to live in. A friend popped in, he’s having huge issues with his builder. Makes me love you guys even more, every time I hear a story like that and there seem to be an awful lot of them! We love our Viva built home, it’s truly a warm, unique home that is a pleasure to live in. I had a mate who is an electrician visit the other day, he was amazed with the house, he said “you can see the craftsmanship and this house will never date”. Thank you so much guys! Thank you for all the hard work and perseverance – it brought me to tears this afternoon! We made it! Thank you so so so so much! We can’t believe we’re finally here. It’s better than we’d hoped for. It’s so much better in real life. We appreciated working with Viva and architect to turn our dreams into a real plan. We loved the workshop where so many people came to pour sweat, passion and laughter into our dream. We enjoyed and appreciated the relationship with the Viva team and watching the house become a home. 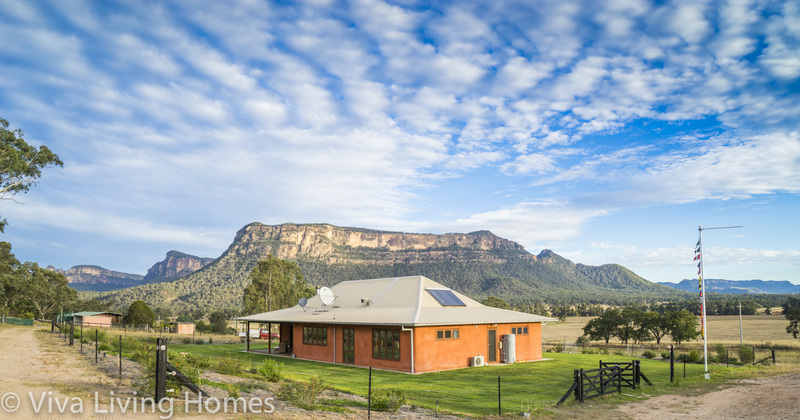 Now we’re loving our beautiful passive solar straw bale dream home very much. It’s been a great journey. We had a dream since I was young. To move to the country and build a natural, eco, beautiful home for us and our children. Finding a builder that not only has similar beliefs but is really easy to get on with was what made our house building journey so pleasant! With very similar philosophies and the same end goal in mind we’re now the very proud owners of a beautiful straw bale home. We just love it! We love the fact that it can drop to -5 degrees overnight but not drop below 20 degrees inside – with us only using a small wood fire heater for part of the night! We love the gorgeous deep windowsills, the natural fibres used, the health and environment benefits our house provides our family. We pinch ourselves everyday! The most stressful things on the build were things we were doing. Thank you. We just have to write to the good folk at Viva to say that although the thermometer reads 42 outside, it’s a very acceptable 25.5 inside – and we still have not gotten around to hanging block-out curtains. Our friends think we have an air conditioner. Hurrah!!! So glad you talked us out of installing an air con! We cannot say enough about the Viva Team including Sam, you were superb. Thank you! We have wanted a straw bale home for years. And now it has happened. Our home is fantastic, exactly as we had imagined. The experience of building with the Viva team was like meeting old friends over and over. There were no issues, communication was perfect, and all expectations exceeded. Our home is comfortable, healthy and happily lived in by us and our 3 kids. Sam and Simone’s commitment to ensuring our house was just as we wanted was exceptional, constantly ensuring we were pleased with the outcome. And we are….. and will be for years and years to come. “We liked the thought of straw-bale but initially thought it would be too much work to build on our own…but once we found Sam and Simone Vivers, they understood what we wanted and were able to help us realise our dreams. We had one Key Performance Indicator… that we would like them as much at the end of the project as we did at the beginning… it had its financial and other challenges, but this is a KPI we are glad to report they met with flying colours.” This was the multi award winning, two storey strawbale home. We just wanted to say it has been a delight working with you and we love our home. Many people have problems getting builders back to make things right. We are delighted to be able to tell people we had the very best experiences with you. Thank you very much. It’s such a spectacular home, and so peaceful. We felt right at home as soon as we entered. There are no other homes like this. It is truly magnificent. I have worked with Sam at Viva Living Homes for several years now and during that time, have found their workmanship second to none. In particular, Sam is open and honest who’s building and carpentry skills are admired by those in the industry. He’s down to earth and trustworthy, is the first to admit if there’s a problem, but is the first fix and resolve anything straight away. His skills as a businessman, builder and carpenter are values to be highly regarded and sort after. “We’ve loved the building of our home. Communication has been fantastic. Between Lee keeping us up-to-date at every stage of construction and Karen making sure the invoicing is clear and concise, you must be very happy having such a great team working for you. We’re also extremely happy your level of workmanship and attention to detail on our house. You were the only people who had the best reputation in the industry”. Ruth welled up with tears of happiness as we handed over home to her.